Use the light side for reading, then when it's time for some shut eye, flip it over to the clock side. From bedtime to go-time, this compact light and alarm combo makes your routine easy as Sunday morning. 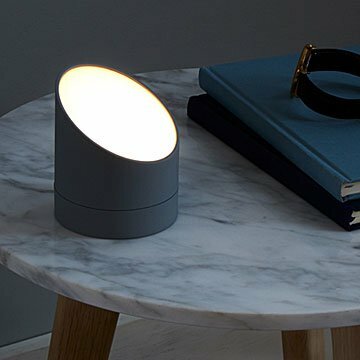 Use the light side for reading, then when it's time for some shut eye, flip it over to the clock side (the light is soft, so it won't disturb your sleep). If you need a snooze, just give it a shake. To turn it off completely, just give it a flip. Its space-saving design will leave room for all those books you'll get to eventually, or fit in your suitcase for easy travel. Includes a USB charging adapter. Made in China. I love this little light/alarm clock!